Have you ever had to live without hot water? Most people I know were born and raised in the U.S. and have probably never given much thought to hot water. You turn on the hot tap, and a few seconds later, hot water rushes forth. It’s almost miraculous when you think about it. I’m not sure if it’s worse not having any hot water at all, or having a water heater that only works on occasion. Flip a coin – are you feeling lucky? We’ve had our hot water “fixed” once already, when it was working less often than it is now, but it’s still finicky, and even when it works “as designed” – it won’t work properly for us. It also isn’t always even working as designed, but I’ll get to that. We have a Girard Tankless Hot Water Heater. For some reason, some RV manufacturers have decided to forgo traditional hot water tanks and use a tankless system. There are a lot of marketing claims involved such as: “instant hot water” and “endless hot water” (neither of which is actually true). You can spend hours reading all the complaints about Girard Tankless systems if you like, there is a lot of chatter out there. When you have a hot water tank, the water is heated and stored in a tank for your use. If you run out of hot water, you need to wait for more to be heated. In a tankless system, the water is heated AS IT FLOWS through the pipes. This is a huge difference, and can be very problematic in an RV. The way our hot water system works, I mean, the way it is designed to work, is you must turn the hot water on to it’s fullest setting, wait about 12 seconds, and then you should have hot water. However, if you turn off the faucet while you soap up dishes, or wash your hair, then turn the water back on, it will NOT be hot anymore. If you are only turning the water off for about 2 or 3 seconds it will be okay, but there is a short point of time where it isn’t. Instead, the water will often be lukewarm, then very cold again, then maybe it will start to get hot again. Or, you may need to turn the faucet off, wait until the system stops entirely (a few minutes), then turn it on and wait again. All the while, wasting quite a bit of water. Perhaps gallons. In other words, the our tankless water heater gives us the worst shower experience possible. Sometimes there has been screaming involved. I also don’t mind hand-washing dishes in normal circumstances. I DO mind washing dishes with ice cold water. Now, keep in mind, we have a 30 gallon fresh water tank. If we are connected to water service (and sewer service) at a campground then sure, we can take a long hot shower as long as we never turn the water off. Many campgrounds do not offer full hookups, so here is where the physical limitations begin. Our shower head is rated for 2.5 gallons per minute. Due to the Girard design and high flow needs, we are unable to switch to an Oxygenics shower head with a lower flow rate. We are also unable to practice any water conservation methods, such as using the pause button on our shower head (pausing the water while soaping and shampooing can save several gallons of water). The Girard tankless water heater makes bookdocking (dry camping) impossible. Want to get way from a campground? Better have huge water tanks! Since our water heater only works on occasion, I’ve had my share of ice cold showers (I don’t recommend it, it’s excruciating), and washed dishes with cold water, making myself freezing in the process. One of our main goals for getting the van we did was to dry camp in remote locations and go off grid. The way things are now, being at campsites with only partial hookups is stressful because we don’t have the tank sizes to allow “endless water!” It also takes a person near the water temperature dial in the kitchen to alter the hot water temperature as needed because if you alter the temp at the faucet and add cold water – you’re pretty much screwed and have to turn everything off again, wait, etc. These are not things you want to be doing while you are mid-shower. And yes, every single shower Dave or I have had in the van has included asking the other person standing in the kitchen to adjust the dial. Girard – what were you thinking when you designed this system?! Obviously living with our current hot water system is not an option. After much research, we have decided that switching to a water tank may be too much retrofitting (surgery) for our van. There is a different make and model of a tankless water heater that supposedly will continue to allow hot water even when pausing the water flow, or lowering the rate (using a water conserving shower head). Although we would much prefer a water TANK, switching to another tankless shouldn’t be too hard with our current van configuration. Once we decided on the water heater to get, we then researched the available service centers that work with these water heaters – and found a highly rated center in Chino, California. We have an appointment in a few weeks and I am counting down the days! I can’t wait to take a hot shower the proper way – pausing water and all! Boondocking, here we come! 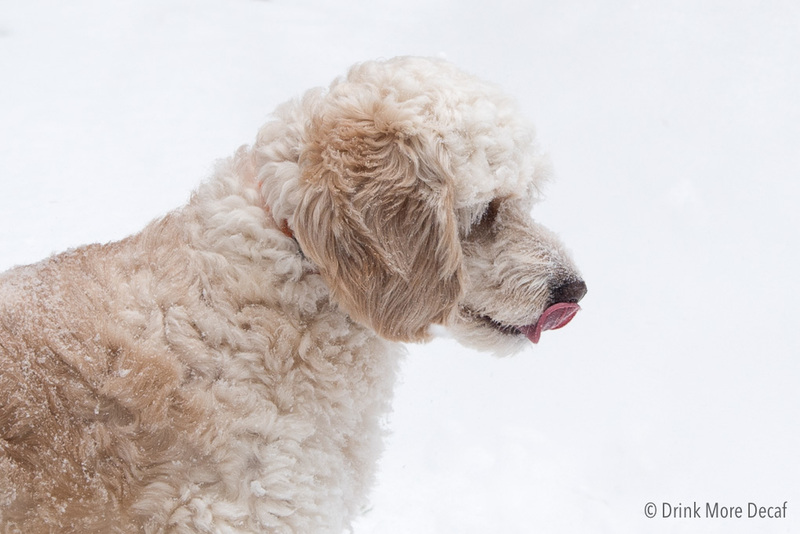 There is a time and place to be cold – such as your dog playing in the Snow!